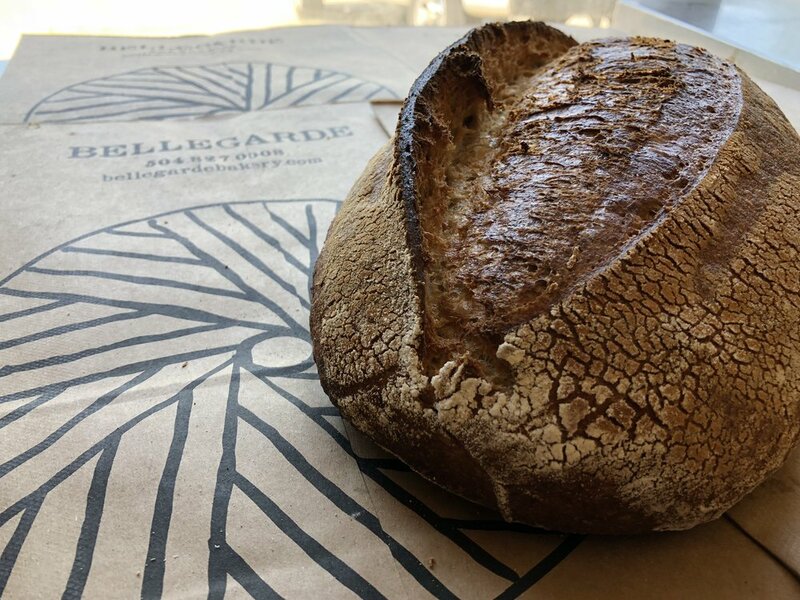 About: The most simple and most beautiful loaf of bread: naturally leavened and made with freshly milled flour. Fragrant, moist, chewy, complex, with excellent keeping quality: a true fingerprint of the farmer, miller, and baker’s terroir. Pairs with everything. Mixing: Combine flour, levain and 90% of the water in a container. Stir and mix using a ‘claw’ until it’s a shaggy mass. Cover. Let rest 30 minutes. Add remaining water and salt, mix thoroughly. Fold three times at 20-minute intervals. Divide and retard in fridge overnight. Bake the next day in a Lodge cooker at 550* for five minutes, then drop to 450*, until desired doneness. Scoring Guide: Chevron, Diamond, Wheatstalk. Levain: Equal parts 80* water, flour, levain. Combine and let rest 3 hours.